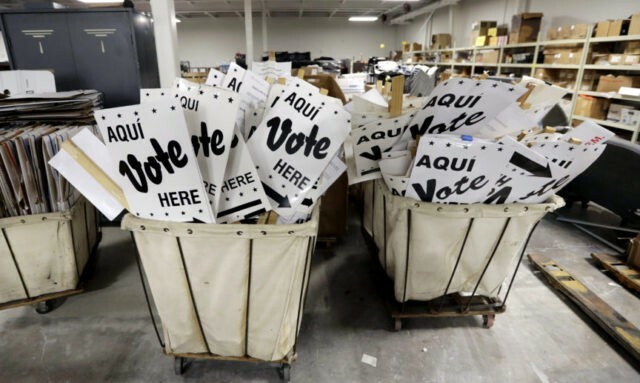 AUSTIN, Texas (AP) — Texas kicks off primary season ahead of the 2018 midterm election, with implications for Democrats and Republicans alike in an election year that could alter the direction of Congress and statehouses around the country for the final two years of President Donald Trump’s term. Democrats remain underdogs to knock off Republican U.S. Sen. Ted Cruz and Gov. Greg Abbott, but there’s been a surge in numbers of Democratic candidates and voters that reflects nationwide momentum for the left since Trump’s election. There is at least one Democratic candidate in every congressional district — 36 of them — for the first time since 1992. Democrats have 25 contested congressional primaries, and leading Senate candidate Beto O’Rourke raised $2.4 million in the final three months of 2017, more than Cruz’s $1.9 million haul. Registered Democrats outnumbered Republicans in early voting in the most populous counties tracked by the state. Democrats cast more than 406,000 ballots compared to Republicans’ 353,000. In the 2014 midterm primaries, Republicans posted a 3-2 advantage in early voting. The president won Texas during the 2016 nominating process and in the November election. Now he’s a central figure in midterm primaries. Republican Congressional candidates across the state have pledged fealty to Trump. It’s not uncommon for the Democrats’ House campaign arm to have favorites in a primary, but they stepped beyond that recently, openly criticizing a Democratic hopeful in a Houston-area seat held by Republican John Culberson. In a memo posted online, the Democratic Congressional Campaign Committee called Laura Moser a “Washington insider” and blasted her comments published in a 2014 Washingtonian magazine article. Moser said she’d “rather have her teeth pulled out” than live in rural Paris, Texas. Party aides say the comments would be used by Republicans to make Moser unelectable in the 7th Congressional District, but their intervention has miffed Texas Democrats, including some of her opponents. Liberal groups also have cried foul. Moser is running to the left of other leading candidates, and Our Revolution, Sen. Bernie Sanders’ political organization, endorsed her in the wake of the DCCC memo. The battle is sure to intensify if Moser qualifies for an expected runoff. Three Texas congressional seats — the 7th District in metro Houston, the 23rd District from San Antonio across border country and the 32nd District near Dallas-Fort Worth — are among the 23 Republican-held seats nationally that sided with Hillary Clinton over Trump in the 2016 presidential race. Democrats need to flip 24 GOP-seats to reclaim a majority in the U.S. House. The Houston seat is likely headed to a runoff. The question is whether Moser, the liberal criticized by national Democrats, is among the two candidates. The San Antonio-border country seat could yield a runoff, as well, between Gina Ortiz Jones, an Air Force veteran, and Jay Hulings, a former federal prosecutor. O’Rourke and Cruz aren’t on the same Senate ballot yet, but the primary will be the first test of their standing ahead of their almost certain Senate matchup in November. The Democratic congressman outraised the Republican senator in the last quarter of 2017 and has touted his candidacy’s grassroots appeal for Texas Democrats who haven’t had much to cheer about lately. Cruz, who has nominal primary opposition himself, isn’t taking the race lightly, however. The senator also is using his stature with endorsements in several of the 21 contested Republican House primaries. While it’s not any absolute harbinger of November, it will be worth checking O’Rourke’s vote totals compared to Cruz’s to see what kind of gap exists ahead of their fall campaign. Texas has eight sitting House members who are not seeking re-election — six of them Republicans — meaning the state with the second-largest delegation will be losing a lot of experience and leadership in Washington. The outgoing lawmakers include powerful committee chairs including Jeb Hensarling, 60, who heads the House Financial Services Committee and Lamar Smith, 69, who chairs the House Science, Space and Technology Committee. Each of them hails from solidly Republican districts, but they could be replaced by even more conservative nominees. Both Hensarling and Smith were being term-limited out of their chairmanships but were well positioned to continue exerting veteran House influence had they stayed. In other statewide offices, Abbott and Lt. Gov. Dan Patrick face only token opposition and are expected to cruise to the GOP nomination. Attorney General Ken Paxton, who is under felony indictment on charges of securities fraud, is unopposed in the primary. Democrats have not won a statewide office in Texas since 1994, the longest streak in the country. Follow Bill Barrow on Twitter at https://twitter.com/BillBarrowAP . Follow Jim Vertuno on Twitter at https://twitter.com/JimVertuno .